Today we have a special treat. 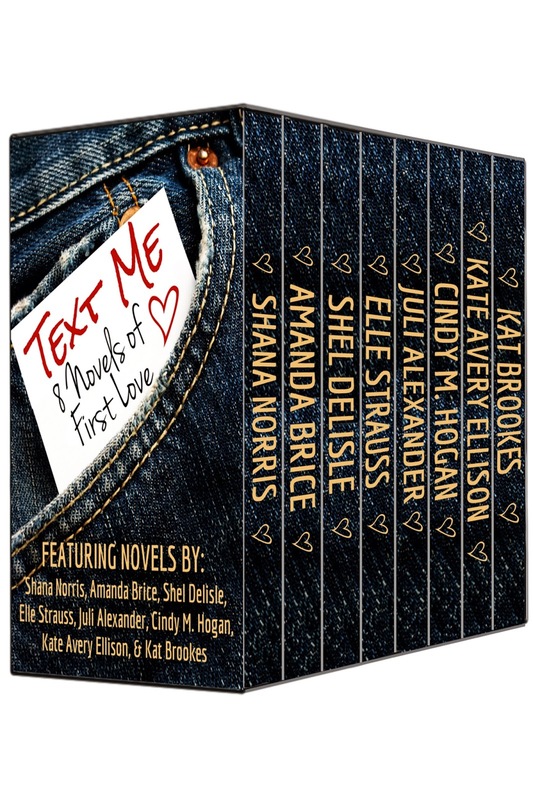 To celebrate their story bundle TEXT ME: 8 Novels of First Love, the authors are sharing their own first love stories. It is sort of like a box of chocolates. You never know what might be inside until you take the bite. Be sure to read about the deal they have on their bundle too! Hi, I'm Shana Norris. My first love was my cousin's friend, who I met at my cousin's eighth birthday party. We skated together, he bought me a little plastic ring from the gift counter, and then…I never saw him again. Brokenhearted at an early age! Hi, I'm Amanda Brice. My first love was a sweet boy named Matt. We held hands on the bus and kissed at the junior high dance. He moved away during the summer between 7th and 8th grade and I didn't see him again for 20 years. We ran into one another on the Metro in DC one day in our early 30s. He looked nothing like he did back then but I knew it was him because he was wearing a sports team jacket that had his last name -- and it's a very unusual last name. Weirdly he recognized me right away. Hi, I'm Juli Alexander. My first love lasted only a few days. He was six, and I was five. He lived across the street, and we used to climb the tree in his yard. We shared a kiss while sitting in the tree. To this day, the taunts of sitting in a tree, ki-ss-in-g bring back the memory of the nameless, faceless boy, the tree, and the litter of kittens I loved even more than I loved him. Hi, I'm Elle Strauss (sometimes I go by Lee Strauss). My current love has been my love for 27 years. We promised we'd grow old together - and we are! Hi, I’m Cindy M. Hogan. My first love came slowly, softly. It ended the same way. But, somewhere in-between, it hit me, hot and hazardous. Hi, I'm Kate Avery Ellison. My current love (and husband of six years) was a close friend of mine who was determined to remain "just friends" until a ruptured appendix landed me in the hospital, and he realized how scary the idea of losing me was to him. We went on our first date as soon as I was well enough to sit in a coffee shop. To celebrate Valentine’s Day the eBook Bundle TEXT ME: 8 Novels of First Love has been marked down to 99 cents! These eight light-hearted teen novels are from eight bestselling authors with more than 300 combined reviews and an average 4.3 star rating on Amazon! Discover a new favorite or a new series with this box set of contemporary and paranormal first love stories with sassy heroines that will have you crushing, swooning, or laughing out loud. Purchased separately these eight novels would cost more than $20.00, so you can get a whole bundle of great reads for a great price! What a fun blog, Kai! Thanks for doing this! Thanks for stopping in, Kat, and for sharing your 1st love-ism. Ladies, I enjoyed all your stories, thanks for sharing! And Kate's and Kat's are so sweet. I'm so glad they could stop in. I loved hosting this interview.